I knit this shawl up over Christmas break and finally got around to photographing it (playing around with my camera remote and tripod). This is Emily 2 by Kieran Foley, and I knit it with some beautiful Madeline Tosh lace in the Baltic colorway and a bunch of seed beads that matched perfectly, which is probably why you can't see them in the picture. This was my first time working with beads, and it was a little bit of an adventure, what with the kids and cats in my life. It turned out nicely, and I don't think I lost too many beads in the process. I didn't block it severely, so it's not nearly as open as Kieran's. I may re-block at some point. This version of Emily is knit from the top-center down, like many triangular shawls. The other version of Emily is knit from the bottom up and starts with a jillion stitches, so when I saw that Kieran had come up with a top-down version in December, I snatched up a copy. The beads kept my attention from wandering too much - this is a garter stitch shawl after all, and the only serious lace action comes at the end. In other news I've decided to move the blog. I've been working on a redesign of my other blog and will abandon good ol' Purly here on March 1st. There will be a redirect post here, then, but you can go check it out now at kathleendames.blogspot.com. I have to figure out what to do with the Purly content but will probably just leave it here, as is, and continue on from March 1st at the "new" place. I'm thinking about a little contest and giveaway, too, since I've never done that before. I will, of course, keep you posted. More FO's and patterns to come, too! So, I have this dilemma. I blog here (sporadically) as "Purly", which is my Ravelry ID. But the blog is "Purly-Gloucester", and I no longer live in Gloucester (with all the pluses and minuses that go along with that). 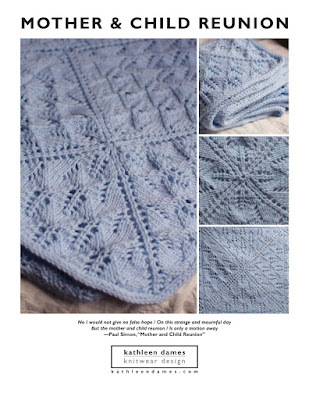 I also have a blog under my (new-ish - it has been over two years since we got married) name, Kathleen Dames, where I post my pattern pages, as well as samples of my graphic design work. I've been working to consolidate my identity in the "real world", especially after losing my driver's license some time between passing through security at O'Hare after Thanksgiving and leaving for the airport for Christmas break. It's probably somewhere in the house, batted by cats under something like the refrigerator or piano, but that didn't help me, nor did my expired passport, which I managed to travel on anyway because the security folk could see that I was a harried mother of three, not someone intent on doing something horrible on a plane. Anyway, I renewed my passport and was even able to change my name there in the process. Now, it's just Social Security and then figuring out what to do about the DMV (I should be able to get a copy of my driver's license from Massachusetts, otherwise I guess I'll have to take the test here in New York). But it's such a hassle, isn't it? Don't get me wrong, I'm thrilled to be Kathleen Dames. Thrilled! But it's a pain getting things all consolidated. And it's freaky when you suddenly realize that you don't have your driver's license. It's one of those things that only comes out of my wallet at an airport. Then I had a really hard time giving up my (expired) passport, since it was the only form of government-issued ID I possessed. But now I've got a shiny new one with my proper name and a whizzy security chip and everything. So, is it time to get all shiny blog-wise, too? I'm thinking it's time to consolidate over on Kathleen Dames and be done. Except that I now have new readers arriving here from Knitty (yay!). I guess there is never really a good time to make the switch. I will keep you posted! At some point recently it became embarassing that Isobel didn't have a sweater knit by mom. Mittens, hat, cowl, her own little In the Shallows (in bubble gum pink, no less), but no sweater. So, some time on Ravelry, a stash dive, a few skeins of bulky yarn reclaimed from a never-finished shrug, and a trip to M&J Trimming yielded this Pipit. She'll only get the rest of the winter/spring out of it, but then Penelope should have a long ride with it. As you can see, the model/recipient loves it (and the camera). She's worn it for at least part of the last four days. Ravelry details here. There are more FOs that haven't been photographed yet, so stay tuned. Hopefully, I'll get back on track tonight and finish this shawl up soon. My refusal to cut out the snarl is testament to my grandmother's stubbornness - this is the shawl that I didn't get to finish for her last summer. I've been thinking about this a lot - the difference between art and craft, and where knitting and knitwear design fall. There are some people who think what we do it art, some say it is "just" craft, but I see it a little differently. I see my design work (and that of others) as craft, but the highest level of craft, say, artisanal, rather than "crafty", if you know what I mean. Both the knitting and the designing require a high level of skill, attention to detail, appreciation of materials, and creativity. At the end of the day we have created another sweater/shawl/pair of socks, just as a master woodworker has created another bowl on her lathe. I really love working within the confines of knitting; it's rather like a sonnet. There are strict rules controlling the structure, but within those confines, the artisan is free to unleash her creativity. When I designed books all day, every day, I always enjoyed creating something useful and beautiful that could be reproduced in quantity at a reasonable cost. To some extent a book is a book is a book. But as we all know, books are judged by their covers because we are visual creatures. There are "rules" for what makes a book (bound on one side, loose on the other sides to allow it to open, usually with a cover and spine conveying the basic information of what's inside), but within that we have Goodnight Moon , Knitter's Almanac, and The Cheese Monkeys. Really, it's what we do within the confines of the form. Knitting is best called a craft. It serves life and is relatively ephemeral. It gets worn and wears out (hence museum collections are sparse). It can be expensive, but is almost never precious. Its structure is more limiting than the structures of tapestry and embroidery. Therefore knitting is widely practised by non-professionals and tends to be a people's craft. Therein lies much of its interest and the fascination of knitting history. I appreciate the fact that Rutt notices the "cult of 'artistic impsiration'" that sprang up around fine arts in the 18th century and that he sees craft as having its own value. And it is interesting to be reminded how fleeting the knitted item is. Just the other day I wore through the tip of one of my glove fingers. Now I have to decide whether to fix it (I do have more of the yarn) or knit something new. (I know, obnoxious problem, isn't it?) Either way, knitting doesn't last forever, and it isn't economically precious, no matter how skillfully worked, except perhaps those vestment gloves in the Spence collection (I've blogged about them before) worked with gold and silver threads. Of course, it is precious to those of us who spend long hours designing and/or knitting the thing. Let's consider it "dear", economically speaking, when we consider the time and effort that goes into what we create, as well as the dearness of some of our chosen materials - quiviut, anyone? What do you think? I know Robin asked a similar question on her blog recently. Her readers seemed to come down on the side of art. And what we do is artistic. But is it art? I think of art as unique, though you could argue that every Turn of the Glass or Ishbel (of which there are 8868 projects on Ravelry) is unique, a combination of yarn choice, individual gauge, personal preferences as to size, blocking style, and so forth. But when I (or any other designer) write a pattern, it is so that the item in question can be recreated by someone else's hands (or my hands again). I think one of the things people object to on "craft" is that the word has been sullied, commodified, dumbed-down. There are crafters (artisans) who take their craft to a very high level, to the point where their creations approach art. I own a Nantucket Basket by Martin Brown, and I don't want to tell you what it cost. It is on display on my dresser, and I would probably grab it if the building were on fire. It is completely different from the "thing" I made in summer school basket weaving at Washburne in sixth grade. I suppose that is a function of experience, skill, and, yes, artistry. There are also those crafters who make things to pass the time, who don't look at what they do as Craft-with-a-capital-c. Not all of them pursue their craft beyond the basics, but that is really what distinguishes the crafter from the artisan: persistence, passion, and a drive for perfection. I agree with Reverend Rutt. Knitting, for me, is Craft. And I'm very proud of my craft. You should be, too. OK, so it really did warrant an exclamation point. At the inaugural Vogue Knitting Live! I was lucky enough to take classes with Franklin Habit, Fiona Ellis, Debbie Bliss, Merike Saarnit, Meg Swansen & Amy Detjen, and Leslye Solomon, as well as attend lectures by Stephanie Pearl-McPhee and Mr. Habit, and hear a panel discussion with Trisha Malcolm (Vogue Knitting editor-in-chief, Stacy Charles (owner, Takhi Stacy Charles), Debbie Bliss (her very own cottage/mansion industry), Melanie Fallick (former chief of Interweave Knits and editor of her own imprint at Stewart, Tabori & Chang), and Brett Bara (former editor of Crochet Today). There was a cocktail party, a dinner, and a big, busy marketplace. And there were tons of like-minded folk hanging out together for three days in Midtown. If you're friends with me on Flickr, you've already seen this picture, but meeting and taking a class with Meg Swansen was the highlight of my weekend. And I've kicked myself for not getting a picture with Meg's partner-in-crime Amy Detjen who was just as funny (if not more so) and knowledgeable as Meg. My new goal is to get to Knitting Camp. But I started the three-day weekend hustling to Midtown, after tossing the kids at Nick, to get to class with Franklin. It was an intimate group (a dozen of us?) in a hotel room - a real hotel room from which they had removed the beds - pawing Franklin's handknit samples while he talked about the history of lace knitting, focusing on Orenburg, Shetland, and Estonian lace. Franklin is a funny, charming man, and, having taken a couple of classes with him over the years, he is very good at imparting a lot of information without your feeling like you've been lectured *at*. I just wish I could have gotten in to his lace edging class! Instead, I had a class with cable queen Fiona Ellis, which I've already put to good use in a proposal. Unfortunately for me I was whipped by Friday afternoon. After Franklin's class there was Stephanie's lecture on Your Brain on Knitting, which was very entertaining and enlightening. Then a quick scramble for some lunch (N.B. folks who stood in that crazy Starbucks line in the hotel, there is another Starbucks just across the street - you could probably even run over there without putting on a coat), and a chance meeting with a Massachusetts/Maine knitter. I really didn't even think I could make it to the cocktail party. But I stuck it out, spent some quality time at the marketplace, which was really nice, spread out over two floors with seating areas and a couple of fashion show setups. Unfortunately, there wasn't any prosecco at the Purls and Prosecco reception, at least while I was there, and I was really beyond tired by then so had a quick drink (and a super-yummy mini cheeseburger appetizer) and headed home. Saturday started with the lovely Debbie Bliss and a class on shaping with cables, which set my brain abuzzing. Debbie was also generous enough to give us all a copy of her kids' book Essential Knits for Kids: 20 Fresh, New Looks for Children Two to Five , which was very lovely of her. She was gracious and entertaining, signing books and talking about how she got to where she is today. No lecture for me that day, so I had time to check out the marketplace some more when it was in full buzz. My afternoon class was Merike Saarnit's Nupps, Buds, and Bobbles, which was fun and educational. Goodness, are there a lot of ways to make those little bumps! And that night was the big Mohair dinner and fashion show. Everyone I sat with was very nice (they're knitters, how could they not be? ), including one of the finalists for the mohair contest. I wore my finished Grés (pictures to come), and aside from the eggplant in the first course (I'm allergic), the food was good. However, the speeches and such seemed more like an industry gathering, which this sort of was, although most people in the audience were knitters rather than folks who work in the industry. I had to zip out of there after the mohair show to attend a dear friend's birthday party in Brooklyn and was flattered to be carded (hehe) but even more flattered that some other party attendees really liked my sweater. Sunday broke far too cold and early but was so worth it when I attended Meg & Amy's class on EPS. Oh, this was such an awesome class! Meg and Amy are a comedy duo. I loved their Midwestern down-to-earth-y-ness. And the samples they brought to show were beautiful. EZ's knits don't travel any more (and with good reason), but there were lots of recent Meg knits and even more talk about EPS. Though I've read the books numerous times, it was so much fun to go over it all again in person. Some day I'm going to Knitting Camp (and then Retreat); Annie and I have made a pact! But I think we're going to wait until the kids are a little older (and I have some disposable income - it is far away from everything). After my awesome time with Meg & Amy, I was able to attend Franklin's lecture, B is for Purl, on the fun and insanity of deciphering antique knitting patterns. Loved it! My afternoon class was not quite as entertaining. Leslye Solomon is knowledgeable, but she's more of a knit-it-in-pieces type (when Knitty has just published my largely seamless pattern), and her style of teaching didn't quite work for me. I should have known I wasn't going to have quite the amazing experience of the morning when I mentioned to the woman sitting next to me that I had been in Meg's class in the morning, and she gave me a blank look. But it was a good reminder for me that there are so many different kinds of knitters in the world, and there is room for all of us at the table. Somewhere in there I attended the panel discussion on the role of independent designers in the handknitting industry (or something like that), which was ... interesting. When the panelists include the heads of two large yarn companies, a craft book editor, the former editor of a popular crochet magazine, and the editor of one of the biggest knitting magazines, the deck seems kind of stacked against actual, independent knitwear designers. Or maybe that's just me. There were some technical issues with the microphones that made it difficult for the panelists to get into a rhythm. And there was a lot of stress placed on professionalism (meeting deadlines and such) that seemed obvious to me, but maybe it was a wake-up call to others. I was surprised (as was the knitter next to me - another Massachusetts lady) by the edge to the whole thing. Maybe it's because I worked in the publishing industry for a long time, but I wanted to remind these industry leaders that without knitters and independent knitwear designers, they wouldn't have much to do. Just as I always had to remember that without those pesky authors I wouldn't have had many covers to design or books to paginate. Especially these days with the methods of the delivery of information constantly changing, we all need to remember that being the publisher can be in anyone's hands. Granted, the bigger publishers have a more visible platform, most of the time. But even that is changing. None of this is to say that you can get away with being unprofessional for long in this industry (it is small, and word gets around), but I think the industry needs to remember that they wouldn't have much to do without knitters. And somewhere else in there I met Beth Hahn of the charming Miss Flitt series, was recognized by my Turn of the Glass on Friday (and saw Teva Durham wearing her Knitty sweater, Lady Lovelace), caught sight various knitting luminaries at the Market, including la Harlot, Mr. Brooklyn Tweed, and Ms. Go Knit In Your Hat. I know there were others, and I had fun meeting people, myself. So, that's my wrap up of VKL. Sorry for the delay on that, but things are very busy chez Purly. More on that soon. First of all, thanks to all of you who liked Turn of the Glass. I hope those of you who knit it like yours as much as I like mine (wearing it again today). Since its publication I've received some questions and thought I would reiterate my answers here in case other knitters had similar questions. But if I haven't answered yours, please ask. Q. What other yarns might work? A. Not everyone can use madeline tosh DK for whatever reason. If you are looking for a similar hand/kettle-dyed yarn, Malabrigo Rios would be a good choice and is also superwash. A knitter has already worked up the sweater in Malabrigo Merino Worsted, which must feel dreamy, but it certainly pills - the tradeoff you must accept when working with this yarn. Since tosh DK is something of a light worsted, Cascade 220 (regular or superwash) would work, as would Berocco's Vintage or Plymouth Encore. Goodness, there are lots of yarns in this range! Q. Wait! I thought the yarn you used was a DK-weight, but you're talking about Worsted-weight. Which is it? And under materials it is listed as 50g/skein, but on Ravelry it looks like tosh DK is sold in 100g skeins. A. It is a little confusing, but tosh DK is a heavy DK or light worsted yarn. It used to be called tosh Worsted, but the company renamed it to align some other yarn names. Tosh Worsted is now a single-ply yarn, and the yarn used to knit this sweater (tosh DK) is a multiple ply, which will make it a little sturdier. The yarn comes in 100g skeins; the listing of 50g/skein is a typo. Q. I'm having trouble getting started with the chart. Do I have to worry about mirroring the cables on the other half? Any advice? A. Although these look like cables, technically they are twisted ribs; you don't need to use a cable needle to work them, since they only involve two stitches. The twisted ribs are set up so that you don't have to worry about mirroring. By working an odd number of ribs and adding a pair at each increase, all you have to do is remember which rib to work next. Let's call Little Hourglass Rib "A" and Twisted Cross-Stitch Rib "B". In the first row of ribbing, after working Seed Stitch and Stockinette, work the ribs as follows: B, A, B, A, B. After working four rows bookend these ribs with a pair of A's. Row 1 (WS): K2, *p2, k2; repeat from * to end. Row 2: P2, *k2tog-b, then k2tog the same stitches again through the front loops, p2; repeat from * to end. Row 3: K2, *p1, yo, p1, k2; repeat from * to end. Row 4: P2, *ssk, k1, p2; repeat from * to end. Row 1 (WS): K2, *p 2nd stitch and leave on left needle, p 1st stitch and slip both stitches to right needle, k2; repeat from * to end. Row 2: P2, *k2, p2; repeat from * to end. Q. How do I choose a size? A. That depends upon your measurements, but it's probably best to go by your chest measurement, since the ribs are more elastic. The ribbed section can stretch quite a bit without looking stretched out and still, through the play of light and shadow on the purl and twisted sections of the ribs, give the illusion of a curvier figure than you may have. Can you tell that I'm a classic apple shape? I'm sure there will be more questions, so I will add to this post or post another.